Daylight Saving Time will end on Sunday, November 2, at 2 am. Don’t forget to set your clocks back and enjoy the extra hour of sleep! Posted in Buckaroo News on October 31, 2014 by The Buckaroo Blog. There will be an Arkansas National Archery in the Schools Program training for any adult that is interested in coaching archery in our school district. The training will be held December 2nd in the Old Gym on the Norphlet Campus from 9:00am-4:00pm. There is no cost to get certified. For more information, please contact Stefanie Magee at 870-310-1372 or stefanie.magee@smackover.net or go to http://www.agfc.com/education/Pages/EducationProgramsANASP.aspx to register. An archery program is currently in place on the Norphlet campus for grades 4-12 and we would like to start a program on the Smackover Campus for grades 4-12. Posted in Buckaroo News on October 30, 2014 by The Buckaroo Blog. All Smackover FFA members will be selling fruits, meats and other goodies through November 14, 2014. For more information or to order, please contact any FFA member or Mr. Brian Jackson at brian.jackson@smackover.net or (870) 725-1233. Posted in Uncategorized on October 29, 2014 by The Buckaroo Blog. The Smackover High School FBLA and FCCLA have partnered with Charleston Wrap for our major fundraising campaign this year. There are over 500 high quality items to choose from and every purchase you make earns much needed money for our school. Simply click the link above or go to www.charlestonwrap.com to shop. All items purchased will ship directly to you and there is free shipping on all orders over $75. First, register your student and a six digit code will be automatically generated for your student to earn prizes during our fundraising campaign. Then click on the “SHOP NOW” button that will take you to the “Choose how you would like to Assign Credit and Shop” section. If you wish to assign credit to your student, enter the six digit student code into the ”Student & School Credit” section. If you don’t want to assign credit to a particular student, simply enter your school’s four-digit ID in the “School Credit Only” section and the school will earn credit from your purchases. You can even support the school year-round after the sale is over by simply using the four digit school ID. The deadline for orders is November 3, 2014. Thank you for supporting our groups! Posted in Buckaroo News on October 28, 2014 by The Buckaroo Blog. 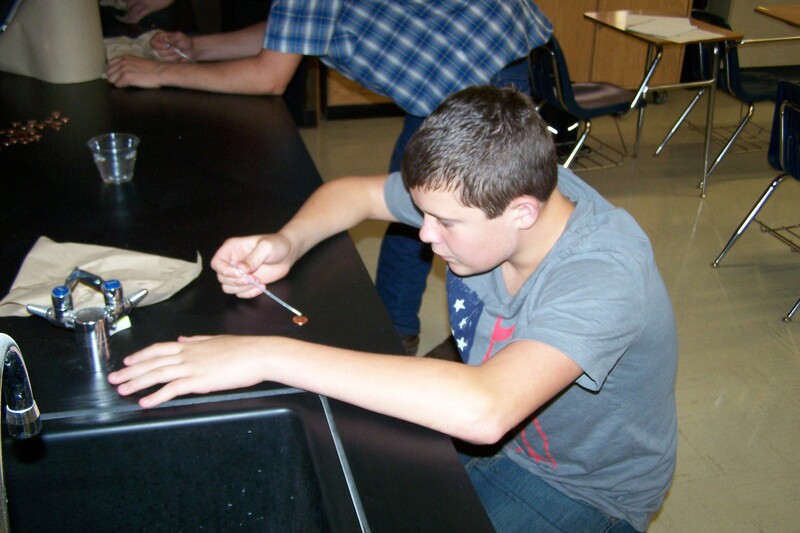 Students in Mr. Tim Bishop’s science classes at Norphlet High School conducted a science lab in which they tried to see how many drops of water could be placed on a penny in order to test the surface tension of water. Posted in Buckaroo News on October 27, 2014 by The Buckaroo Blog. Must pass the Parapro exam or have an Associate’s Degree. Please submit application, resume’, transcript, and/or results of Parapro Exam to Mrs. Holly Strickland, 701 Magnolia, Smackover, AR 71762. Posted in Buckaroo News on October 24, 2014 by The Buckaroo Blog. Posted in Buckaroo News on October 23, 2014 by The Buckaroo Blog.